There’s a lot to love about calzones — and very little (if anything) to dislike about them. That’s why those of us here at National Today are going to celebrate National Calzone Day on November 1 by stuffing a calzone with our favorite pizza toppings and then stuffing ourselves with the results. Of course, since a calzone is actually a folded pizza, those toppings are not really toppings so much as stuffings. Anyway, stuffing is the key — and stuffed we will be — on National Calzone Day. Join us on this most tasty of holidays for some honest-to-goodness goodness. Calzones have become wildly popular in recent years, perhaps due to the influence of television shows, such as "Seinfeld" and "Parks and Recreation," both of which have featured storylines about calzones. It's the first documented use of the word "calzone" to refer to "a baked or fried turnover of pizza dough stuffed with various fillings." Calzones were invented in Naples, Italy — supposedly as a way to serve people a pizza they could walk around with. It's easy to celebrate food-related holidays and observances. Let your stomach do the talking. And then it's time to eat! Have friends and family members over, sit around the dining room table, and have each person build their favorite calzone. Then have a baking party and stuff yourselves silly. We all have our favorite recipes. But part of the fun of National Calzone Day is learning about the many different varieties. Try something new! ​What's in a name? What's in your calzone? The word "calzone" comes from the Italian word for "pants" or "stockings." According to Guinness, the largest calzone ever made weighed 212 pounds. It was baked in 2014 by Rulli's Italian Restaurant in Middlebury, Indiana. Calzones typically have the same amount of pizza dough as a regular pizza. In fact, one whole calzone can contain more than 2,000 calories. 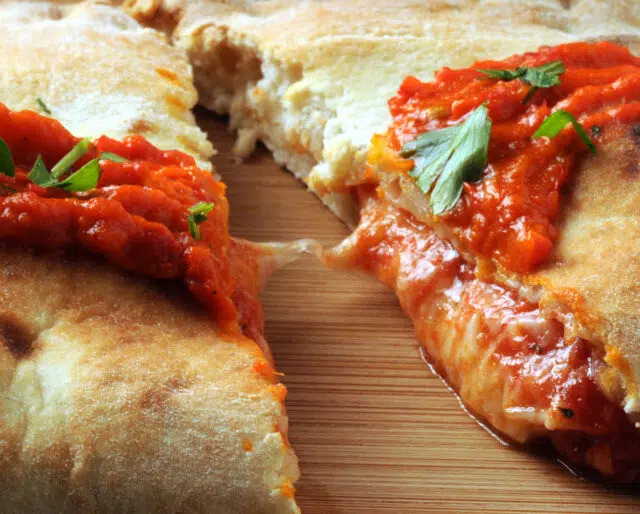 Even the most "typical" calzone is overflowing with tasty goodness: salted bread baked to a crisp, golden perfection on the outside (warm and chewy on the inside), and stuffed with meats, cheeses, and veggies. Science tells us that calzones are not only delicious, but efficient. That's because calzones, folded as they are, feature a lower surface-to-volume ratio than regular pizzas, resulting in better heat retention. Not only do they hold together nicely — what with all that bendy dough — calzones are also flexible in that you can put just about whatever you want inside.